Weekdays during Easter head down to Brooklands Museum this Easter for an action-packed day out for the whole family. As well as seeing the incredible collections of cars, motorcycles and aircraft from the golden age of racing and flying, families visiting during the holiday will be able to experience thrilling car rides, ‘fly’ with the Red Arrows and Concorde, complete our Easter Trail or take part in a fascinating workshop. Every weekday during the Holidays at 10:55 and 13:25. 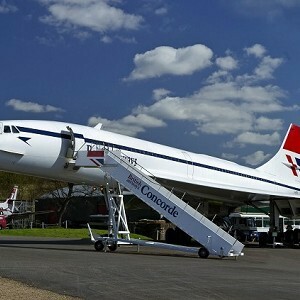 Pre-booking of the Kids Tours on Concorde is highly recommended. Our popular car rides will be operating from 11am-1pm and from 2-4pm (subject to weather). For a requested donation of £1, Take a trip in a vintage-style car up Test Hill or along the Members’ Banking of the old Race Track, courtesy of the Brooklands Volunteer Car Rides Team. Look out for the Bus Stop outside the London Bus Museum and hop on board a London double decker bus for a short trip around the leafy roads surrounding the Museum before being dropped back again. Your conductor will welcome you aboard and ask for a minimum donation of £1 per passenger. Rides last approximately 15 minutes and will run in sessions before and after lunch. Please note: Special holiday activities subject to weather and operating conditions.